Kia is taking a page from high-end automakers by introducing a one-of-a-kind bespoke version of its Telluride SUV. Influenced by fashion designer Brandon Maxwell’s latest Texas-inspired runway collection, a ranch-ready Telluride with saddle-like leather accents debuted recently at New York Fashion Week. 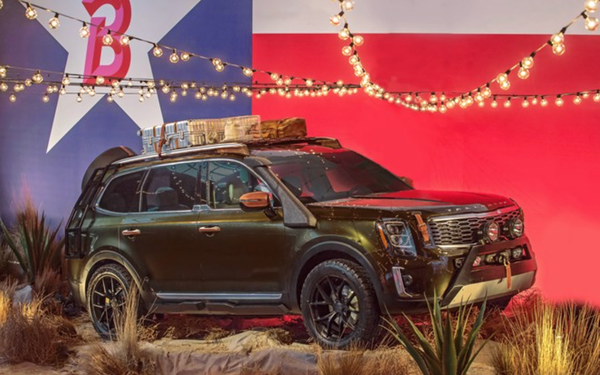 Created by Kia’s U.S. design studio in Irvine, California, the customized Telluride was a flashy way for the automaker to debut the brand’s largest and most upscale vehicle. The SUV’s production version makes its official debut in January at Detroit’s North American International Auto Show. The eight-passenger Telluride production model -- which will be assembled at Kia Motors Manufacturing Georgia -- will provide a new, V6-powered option several inches longer and wider than Kia’s seven-passenger Sorento midsize SUV. Rolls-Royce recently unveiled bespoke versions of several of its ultra-luxury models at a party held during the Pebble Beach Concours d’Elegance. Italian supercar-maker Ferrari has manufactured one-off versions of vehicles outside its mainstream color range. Aston Martin offers a dedicated website to show off its bespoke options. Kia has shown a number of one-off custom cars over at auto shows and events over the years, but the Telluride that debuted at Fashion Week is its first bespoke model to result from a direct collaboration between its U.S. design studio and a fashion designer, says Saad Chehab, vice president of marketing communications, Kia Motors America. The bespoke edition was created to demonstrate the off-road as well as the travel-in-style potential for the SUV, he says. The designer had a natural connection to the automaker: His mom drive him to school in East Texas in a Kia Sedona.